Now that summer is in full swing, me and my kids are very happy to have more time for reading in our schedule. We all have varied reading interests, so our lists cross genres and types. So what are we reading? All of the books on Elizabeth’s list! I’m sure we’ll be adding and changing books as the summer goes on, plus adding some audio books. What are you reading this summer? Please share in the comments! Schools across the country are letting out, to the joy of children everywhere. My children’s last day of school for the year is today, and while they enjoyed school and are both looking forward to moving up to new schools in the fall, they have many plans for the summer. Every summer we try to learn new things, both children and adults alike. This summer my daughter will try learning to be a better swimmer, tying her shoes, riding her bike with training wheels, and starting to read independently (whew!). My son wants to try some new sports for him – running, swimming, and tennis. For me? I’m going to work on learning to be a better runner, writer, and mom. For all of us, reading is a central part of summer. We have longer stretches available for reading books – whether it is during road trips, cuddled up on the couch in our PJs, or while sitting on the front porch in between bike riding adventures. I’ll share more next week about what we are each reading this summer, but I will tell you that Aidan and I will be doing another reading challenge. We are challenging ourselves to read 20 books again this summer. We took this challenge last year, but didn’t quite make it. We learned from that experience that while we enjoy reading to each other (and will still do so from time to time), we both read faster independently. So this summer we are taking more of a book club approach (if you can have a book club with only 2 members) – we are each reading a book at the same time, and then we’ll have a special sit down at the bakery or elsewhere to discuss it. We are already 2/3 of the way through Harry Potter and the Prisoner of Azkaban, so we’re off to a great start. I’ll keep you posted on how we progress. Happy summer reading to all of you! Often, we enjoy particular authors and read many of their books. 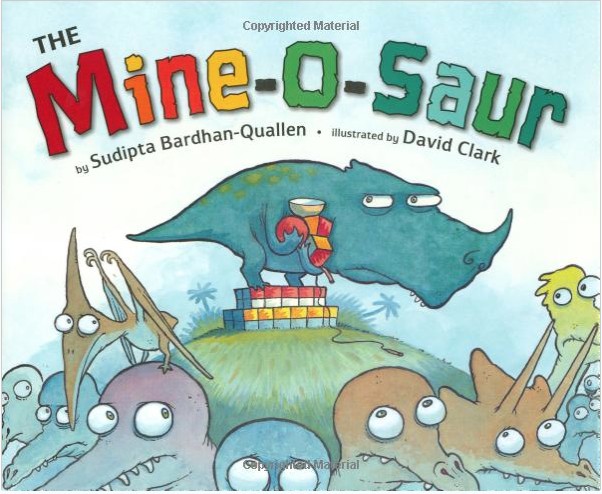 Today, I am featuring Sudiptha Bardhan-Quallen, an author who started her career in biology before finding enjoyment in telling stories to her young children. She began writing non-fiction for children focused on science topics and then biographies of famous Americans. She then branched into picture books, and has written a range of stories. With some authors, you can identify immediately that it is their book based on the style of prose, humor, or topic. In Ms. Bardhan-Quallen’s case, she loves animals (especially pigs), but otherwise each book is different. Some of the books are simpler and more suited for the 3-5 year old range, and some are more complex and may appeal to the 5-8 year old target audience. The Mine-o-Saur is our favorite of the three. It is full of humor, and makes a point about not sharing without it feeling heavy handed. The other dinosaurs also demonstrate different ways to respond when someone else is not sharing. Look for the part where they look down at their knees- one dino in particular is taking it very seriously! 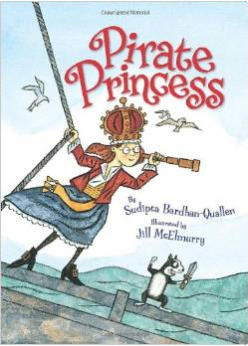 My daughter would love to be a Pirate Princess herself, and the princess in that book stays focused on her dream of being a pirate, despite her parent’s objections and her inability to successfully complete pirate chores. 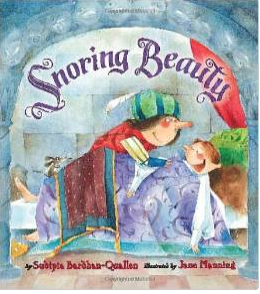 Snoring Beauty is a twist on the traditional tale, told from the perspective of a mouse who really just wants to get some sleep. Some other books from this author that we have not yet read: Orangutangled, Hampire!, Chicks Run Wild, Quackenstein Hatches a Family, and the Hog Prince. What is your favorite Sudipta Bardhan-Quallen book? Please share in the comments!